Thunderous Dutch death metal assailants Sinister return with a new album entitled The Post-Apocalyptic Servant which is slated for release in May 2014. The album will be released on Massacre Records and includes covers of songs by Morbid Angel, Agent Steel and Paradise Lost. Sinister have released a sample track, “The Burden of Mayhem” in advance of the album’s entry into the market. The band made its name in the early death metal years with Cross the Styx which combined the percussive and fast tremolo sounds with an underpinning of melody, creating a mood between the aggressive darkness of American death metal and the melancholic emptiness of its European cousins. Speed metal tyrant Dave Mustaine (Metallica, Megadeth) takes to the stage with the San Diego Symphony to play guitar solos in place of violin leads. He will play along with “Summer” and “Winter” from Antonio Vivaldi’s “The Four Seasons,” Johann Sebastian Bach’s “Air,” Richard Wagner’s “Ride of the Valkyries” and Antonín Dvořák’s “New World Symphony.” Mustaine described these pieces as shredding, fast and melodic. 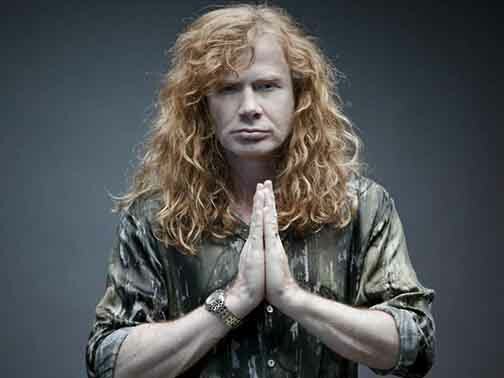 Mustaine also talked about Megadeth’s classical influence since its formation. For the full story, head on over to The Daily Aztec. After metal spent decades expanding its boundaries farther than may be wise, some individuals decided to adopt the inverse of this mentality. Instead of diluting the genre, go back to its roots – and construct songs within an existing framework, rather than trying to do both simultaneously. 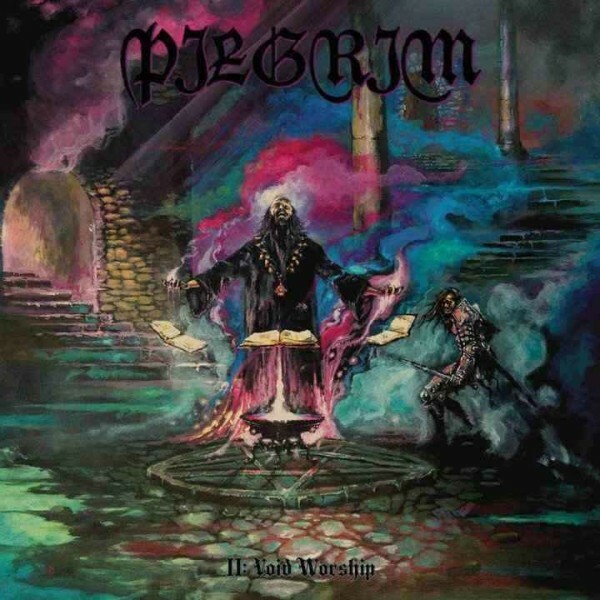 It is here that heavy-metal/doom “retrovival” band Pilgrim enters the spotlight. Their latest release, II: Void Worship, features a version of heavy metal which retains the melodic qualities of that genre, along with the rawer rhythmic structures of proto-doom and doom metal. Likely deriving inspiration from bands such as Mercyful Fate, Pentagram, Candlemass, and Cathedral, songs consist of the prototypical verse-chorus structure characteristic of music partly derived from rock. The songs never reach the nihilistic emptiness of death-metal derived doom, but still are heavier than the standard retroactive 80s fare. 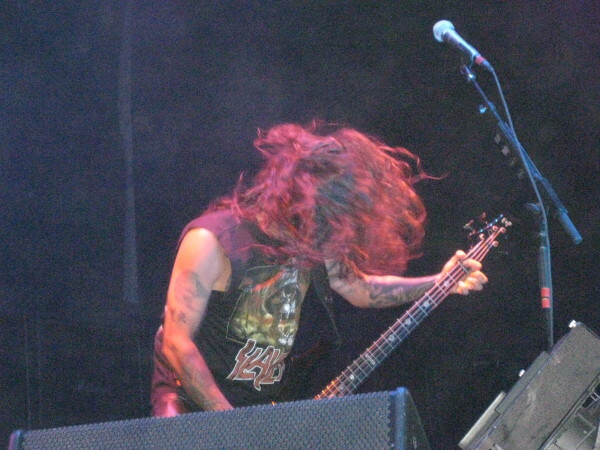 Indeed, the band occasionally incorporates minor chord strumming which brings to the foreground the confluence of influences present upon more melodic black metal bands. It’s in moments such as these in which the return to the past falters a bit, and the reasoning for doing so isn’t made clear. With the vocals providing a prominent grounding for the melodies, when it is utilized songs drive forward with appropriate vigor. Nothing on here is novel, or has yet been unheard, and one should expect this before diving inwards towards this release, or the modern branch of the movement it arises from. However, those who are in search of quality metal that upholds a sense of internal quality control will find some songs to appreciate on this release. As this band is still in its early stages, it will be worth waiting to see if they can preserve their link to their influences while making their individuality more distinct. We live in a land of confusion. Most people here have trouble differentiating between a conclusion and a method used to reach a conclusion. Take for example the phrase, “That’s logical.” To most people, this conjures up a list of things that are accepted as having a basis in logic. When you ask them to parse something new, which involves applying a method to each sequential detail in order to find out how they fit together. That’s difficult; tracking conclusions and having a whitelist/blacklist of accepted ideas is easier. If you want to know how metal calcifies itself, it is through these conclusions. Darkthrone ended up sounding the way they did as a result of their method, putting together all the pieces and coming up with a bigger direction. When bands imitate Darkthrone, none of this happens, and thus none of the music is nearly as good. They know how to imitate it from the surface inward, but they don’t know why it came about it and thus, how to charge it with the meaning the original had. Especially threatening to popular music is the process of calcification by which the method of the past generation becomes the conclusions of the next. Darkthrone makes a great album; everyone imitates it; as a result, that sound becomes stale and disassociated from the meaning it once had. It was once common for metalheads to complain about being misunderstood, and their music not being understood and accepted. Now it is accepted, and it has rendered it harmless. What did that rendering was all the metal bands ripping each other off, churning the original ideas into a mush of imitation. In fact, the problem is that metal when understood is in fact misunderstood, and keeping it not-understood is what is required for people to go back to method instead of just trusting its conclusions as gospel and repeating them in recombined form. Metal is in fact like a snake consuming itself. As soon as orthodoxy is established, it is destroyed and its destroyer rises only to be in turn consumed itself. Parallels can be drawn to ocean waves cresting and then self-destructing, the need for forest fires, how predation ensures that prey animals get smarter, or other natural metaphors. What it fears is the calcification and a related process known as social acceptance. When a group of people encounters a new idea, it mocks it, then tries to destroy it, and finally accepts it. But once the idea is accepted, the process of calcification happens as society assimilates the idea as conclusion and throws out the methods, but even worse, the nature of having the idea accepted means a process of compromise which shaves off the parts of that idea that offend various segments of society (think of a PTA meeting: can’t move the parking spaces, or you upset either the church ladies, the teachers’ union, or the parking authority). Social acceptance destroys ideas through imitation and compromise. This process goes back to metal’s birth. The members of Black Sabbath couldn’t get on board with the happy hippie world around them, so they made their own music which destroyed that illusion with powerful sound. They were reacting to the acceptance of conclusions from the past period, the 1950s, in which people were fed on Dale Carnegie style salesmanship as a means to success. As a result, society stopped being truth-oriented and started being feelings-oriented. Happy feelings meant a sale. Ten years later, happy feelings meant social success. Salespeople knew that acceptance and inclusiveness made sales, so they made their advertising as innocuous as possible. 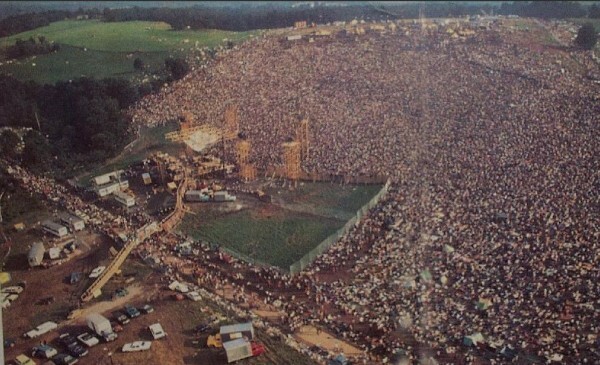 The hippie movement imitated this but used politics instead of profit (at first) as their guide. The problem was that the hippie portion was just as fake as the 1950s salesmanship portion. Similarly, the current imitation of the 1990s black metal scene or worse, the 1980s emo and shoegaze scene, is completely fake. The fifteenth Blasphemy clone is as burnt out as the fifteenth Beatles clone or fifteenth Dale Carnegie graduate. All of it is emulation of the past through its surface, which fundamentally disturbs the metal outlook. For underground metal, all that is left is to seek total nihilism or negation of values, or to pick values that cannot be compromised and thus cannot be assimilated by society. If you want to know why metal has been drifting toward extremes lately, this might explain it. All of this is a rather long path to saying what every teenage music fan does not want to face: it’s time to stop talking about how you are misunderstood. You don’t want to be understood. Even more, being understood would destroy your chance for growth and turn you into an identical suit-wearing conformist droid marching off to do the same stuff the last generation did, and we can see them drinking themselves to sleep every night. When people obviously don’t get what you’re about, thank them. They’re helping you grow, just like they’re helping metal grow every time they run into a WTF moment and toss it out in the dustbin. The journal of the International Society of Metal Music Studies (ISMMS), Metal Music Studies, is now available via subscription through direct purchase from the publisher Intellect Books. Editors Karl Spracklen and Niall Scott have been at the forefront of integrating heavy metal and academia so that the latter may study the former. Until 2016, when membership in the International Society of Metal Music Studies comes with a subscription to Metal Music Studies, interested parties — whether members of ISMMS or not — will need to purchase a subscription at the following location. 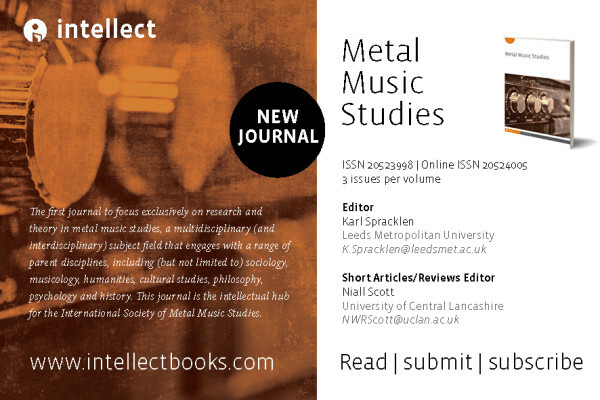 Volume One of Metal Music Studies is available in three issues over 2014 and 2015. Subscriptions will become available for sale in May. We’re hoping for heavy coverage (hehe) of early primitive death metal. 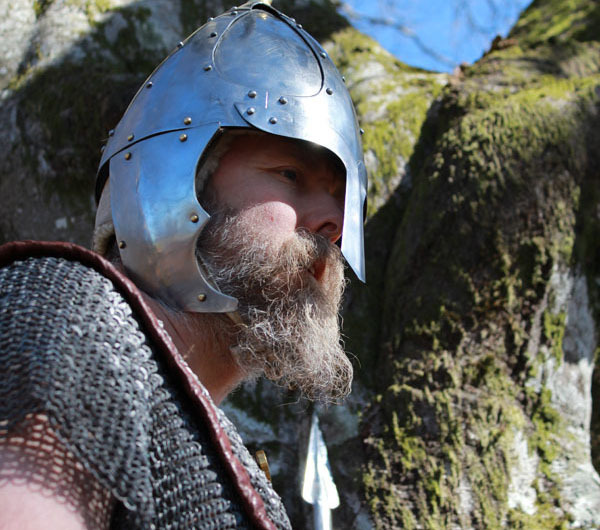 Burzum, the sometimes black metal and sometimes ambient project of Norwegian-descended French national Varg Vikernes, announced the release of new album The Ways of Yore on Byelobog Productions/Plastic Head for June 2, 2014. No further information is given about whether the album will continue with the post-modern black metal style of Umskiptar or the folkish dark ambient style of Sôl austan, Mâni vestan, which was one of our “Best of 2013”. Emerging from the same locus of intensity in Norway that produced Immortal, Mayhem, Emperor and Ildjarn, Burzum began in the early 1990s as a complex riff-narrative style of black metal with unnerving vocals that combines a feral animality with emotional sensitivity. Early works attempted to integrate elements of ambient music and create a sense of ritual designed to “stimulate the fantasy of mortals.” This era ended with Filosofem and composer Varg Vikernes being jailed for the murder of Euronymous of Mayhem. During the incarceration years, Burzum shifted direction to full ambient with Dauði Baldrs and Hliðskjálf. These albums allowed Vikernes to escape the monolithic sound of guitar/bass/drums and work with multiple instruments, culminating in the lush creative density of Hliðskjálf (which was revisited somewhat in Sôl austan, Mâni vestan). After prison, Burzum entered a period of post-modern black metal influenced by droning indie-pop variants of NSBM such as Drudkh and other Eastern European bands. This music reflected pop song structures, a shoegaze-style approach to melody but with the longer phrasing — albeit recursive — of black metal like early Ancient, and extensive use of North mythology. It is unclear whether this period continues now with folkish dark ambient album Sôl austan, Mâni vestan in 2013 being a temporary detour, or whether Vikernes will launch Burzum into a fourth period with the more complex instrumentation and hence compositional density of that album and Hliðskjálf. When Black Sabbath shifted from trying to be a hard rock band to trying to make a horror movie sound appear in guitar music, they opened a new world. It was not a world that would resist opening for long anyway, since if you mix Iggy and the Stooges with the prog rock of the same era like Jethro Tull and King Crimson, you get something a lot like Black Sabbath. But guitarist Tony Iommi, bassist Geezer Butler, vocalist Ozzy Osbourne and drummer Bill Ward did it first, and during the first decade of their career fought through the enduring questions of the genre in prototype form. While Black Sabbath gets classed by most as “proto-metal,” or not quite yet metal, it is also clearly not quite still rock ‘n’ roll. In this perpetual liminal state Black Sabbath, like metal itself would a generation removed, rediscovers itself again and again as a way of outracing the calcification and corruption of message that is common in modern life. 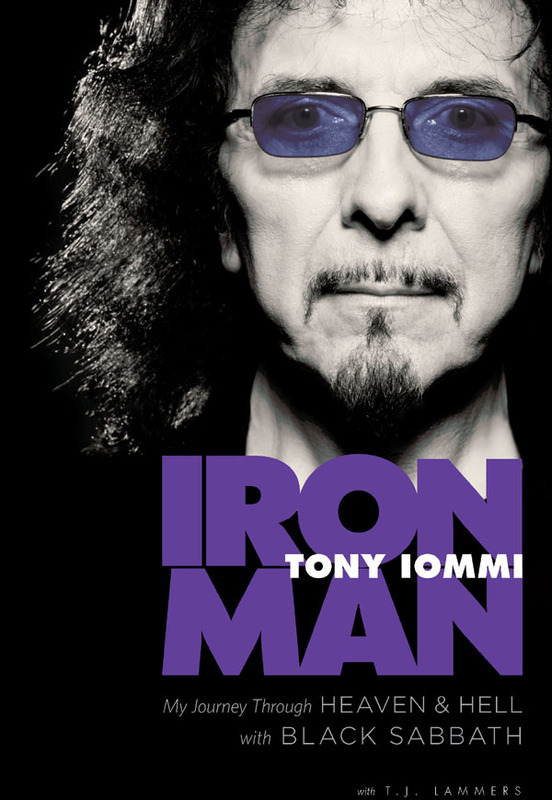 In Iron Man: My Journey Through Heaven & Hell with Black Sabbath, Tony Iommi writes his memoirs for a book that is both everything and Black Sabbath fan could want, and not enough. He writes about everything important and brings out some moments of great clarity, but then at some point the book expands like a drunken conversation and spills too much ink on the less important later Black Sabbath works. Iommi also has an offhand and conversational way of explaining things from his point of view that does not flesh out the details and background enough to let people know what was really going on. However, the juicy stories of rock ‘n’ roll excess, and most of the potent decision points in the Black Sabbath career, are not missed. The narrative starts out fairly crisply and over time slouches into many unresolved threads the way most retrospectives do. The early days were clarity, but after that chaos reigns. Sensibly, Iommi does not spend too long on the days before Black Sabbath, but does set enough of the scene to get the narrative rolling. After that, very little detail is given, and the conversational takes over. Iommi will say that they went to a house or studio somewhere and mention no other detail, but he does spend a lot of time on human relationships. He describes people and their patterns. He also talks a good deal about relationships in the bands and the states of mind of the various players as albums were released. It may be that a Black Sabbath fanbase wants to hear more about the mechanics behind the later Black Sabbath albums, solos and side projects, but to this writer much of this material was redundant. Not that it was mentioned at all, but that it was internally duplicative and went through similar patterns without identifying them. Like a night at the bar, the description of events begins with a clear context, direction and development of events, but devolves into a description of personalities and factual data that seems to focus on complexities. I hope it is not insulting to say this, but people are not as interested in the later Black Sabbath works as they are the earlier ones. We would have preferred the same crispness, detail and narrative integration of the first three chapters be applied to the middle three, with the later ones giving less detail and more of a linear narrative. The reason for this is that the formation of those early albums and the Black Sabbath sound is what defined this band for eternity and will make it forever important. The later stuff shows us four guys out of their depth reacting to the changes in their lives. Details such as the above provide meaning to the listener because we are curious about such things. What made some albums more listenable or more interesting than others? In the compositional process, and the formation of decisions, we can see how they are distinct. Sometimes too much focus on personality and politics not only obscures the narrative, but is a substitute for discussing how decisions were made. Buried throughout are nuggets of clarity such as the above. These make the book not only memorable but poignant, as you can see why so much attachment occurs between these musicians, and how their knowledge of each other was more than practical, but a deep appreciation. Iron Man: My Journey Through Heaven & Hell with Black Sabbath will stay on the shelves because of its subject’s importance to rock music and heavy metal. It will also provide much fodder for others to discuss, as it touches on everything once. While some of us might prefer a two-volume set, with Volume I for the Black Sabbath albums from 1970-1976 and all of the depth of narrative that makes the creative decisions made during that time relevant still, as a quick read and overlook of the Black Sabbath experience Iron Man: My Journey Through Heaven & Hell with Black Sabbath succeeds and also gives us rare if erratic insights into the story behind the band. A group of academics and metal fans called Puerto Rico Heavy Metal Studies spends its time working on a documentary about heavy metal in Puerto Rico named The Distorted Island: Heavy Metal music and community in Puerto Rico. The first trailer, seen below, from this project has been released as of yesterday. Nelson Varas-Díaz, Osvaldo González, Eliut Segarra and Sigrid Mendoza comprise the research and filmmaking team. Dr. Nelson Varas-Díaz is Associate Professor at the University of Puerto Rico and a lifelong metal fan who has led the team in carrying out a research study on the local scene. Heavy metal music is a global phenomenon composed of distinctive smaller communities throughout the world. In this upcoming documentary the glance is turned on Puerto Rico, a Caribbean island whose scene has been active for 30 years in almost complete underground status. The documentary film addresses how local bands have survived for such a long period of time through strong community ties while also highlighting the cultural and historical challenges faced along the way. The film will see release later in 2014.